Hello Loves! You know how much I love glitter, right? Then you know how excited I was when Couture Gel Polish sent me these awesome chunky glitter polishes from the All That Glitters Collection to review! I have to admit that I usually prefer loose glitter over glitter polishes. I find most glitter gel polishes difficult to apply. 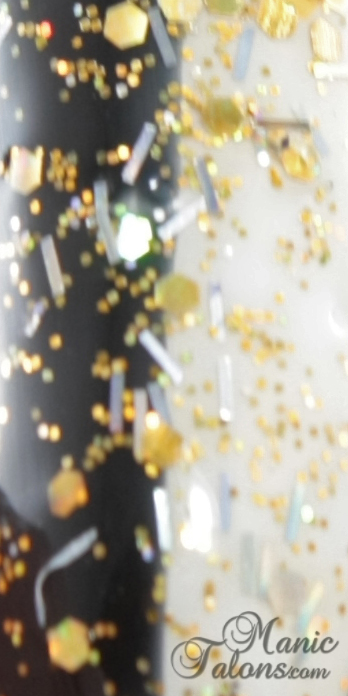 With most, the there isn't enough glitter in the bottle so any attempt to achieve dense glitter coverage on the nail results in pooling of the gel around the sides of the nail. I was pleasantly surprised to find that Couture's glitter polishes are thick so that pooling is less likely. When I say thick, I mean THICK. I flipped these upside down for a few minutes like I do with all glitter gels, and I ended up with so much glitter on the brush that I had to wipe both sides of the brush before applying the gel to the nail. 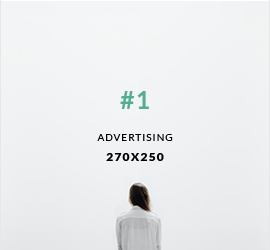 I like that! I didn't find application to be difficult at all. There are actually 6 polishes in the All That Glitters Collection, but one isn't chunky so I didn't include it in this group. I'll show you Classy Girl another day. Note: All swatches are 3 coats over my natural nails. I also prepared half black, half white swatch sticks and applied one coat of each glitter on top to show how they look over light and dark bases. First up is Sugar Daddy. This is a slightly olive toned jelly base that is packed with green and blue hex glitters, ultrafine green and holographic glitters, and silver holographic strip glitter. On it's own, this one isn't the best color for my skin tone, but it will be perfect layered over a solid base. 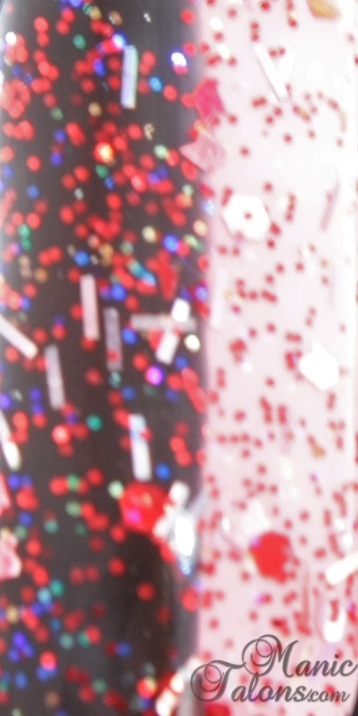 You can also see the individual glitters a bit better in this swatch stick close up. I am definitely going to use this one in my St. Patrick's Day mani! I failed to really capture the holographic effect in the close up on this one. I apologize for that, but I promise it is there. This gorgeous gold glitter is Put A Ring On It. This one is a slightly gold tinted jelly base with gold and holographic ultrafine glitter, large gold hex glitter, silver holographic strip glitter, and random large holographic silver hex glitters thrown in for good measure. The result is a very festive topper that makes me think of Christmas. I lost the holo effect of the silver strips in this one as well, but they are the same silver strips that appear throughout these swatches. Fireworks is one of my absolute favorites out of this group. The sheer, red jelly base is packed with red and holographic ultrafine glitters, large red hex glitter, and the silver holographic strips. 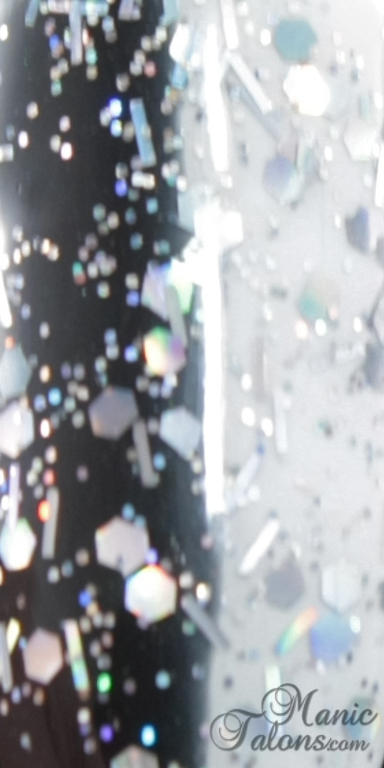 You can see the holographic color shifts very well over the black in the closeup swatch below. Drama Queen is a gorgeous light blue glitter mix that is tied with Fireworks as my favorite in the bunch. This light blue jelly base has a similar mix of ultrafine glitters, larger hex glitters, and the holographic strips. But something about the blue just screams my name. It has that glittery sparkle yet is calming at the same time. I'm not really sure why, but this one makes me think of rain drops. Finally, the last of the chunky glitter polishes is Material Girl. This one is a bit different than the rest in that the pink jelly base is much darker, which make the glitter a bit more subtle. The same glitters are there, though - ultrafine, large silver hexes, and the strips. There seem to be fewer large hex glitters and strip glitters in this one. As you can see in the picture below, because of the darker jelly base, this one does tint the black side a considerable amount. What do you think of Couture's All That Glitters Collection? Do you have a favorite? Note: All polishes shown in this post are press samples that were provided by Couture Gel Nail Polish for my honest review. Those are pretty! :-) It's nice that there are more fun gel polishes coming out lately!! Does anyone know where I can buy Couture Gel Polish in Europe? Thanks!